Shuki Gilboa, left, tackled the terrorist who murdered a 13 year old girl, Hallel-Yaffa Ariel, as she slept in her own bedroom in Kiryat Arba/Hebron. He is recovering from his injuries in the Sarah Wetsman Davidson Hospital Tower in the Plastic Surgery unit. 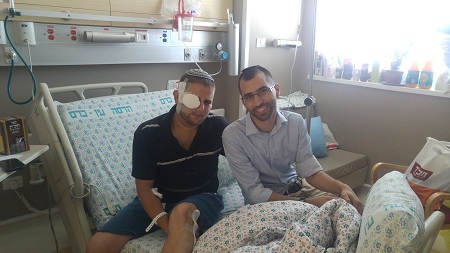 The photo shows Shuki being visited by Dvir Mussai, a long-time Hadassah patient who was blown up while picking cherries in a farmer’s field not far from Hebron when he was 13. Dvir has undergone more than 30 surgeries.